Our ingenious yard accessory has it all for your yard or garden. 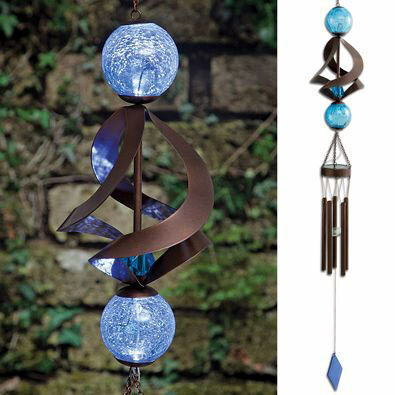 Solar powered blue glass crackled spheres are powered by a solar panel that charges the NiMh battery during the day and lights up two LEDs within the spheres at dusk. Bronze colored metal spinners at the top capture the breeze and spin, moving the glass clapper at the bottom to create melodious sounds from the metal chimes below. On/off switch under solar panel. Measures 50" long x 7" wide. Comes with large metal hanging hook and metal chain. *Sorry, express shipping and gift wrapping is not available for The Ultimate Solar Spinner Chimes.